Craft Sew Sweetly: My Newest Adventure! So, I haven't been doing my normal crafty things lately. I'm a little scared to saw my pallet and I need a different sewing needle to finish my hooded towel. Boo. 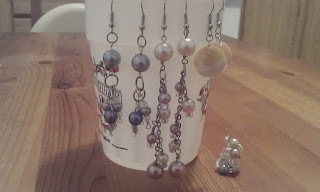 But my friend C showed me how to bead a few weeks ago! And here are the things I've made from left to right are oldest to newest creations. Pay no attention to the cup design. It's the only thing I could think of that would show all of my earrings. I really like my newest earrings on the right. I scored these awesome shell beads from the thrift store. Well worth my money. The middle pair turned out well, but are a tad too long for my liking. The thing not on the cup is called a "bead bomb". It's a bunch of beads on wire, all woven in and out. I plan to put it on a bracelet or necklace eventually with other trinkets/charms. 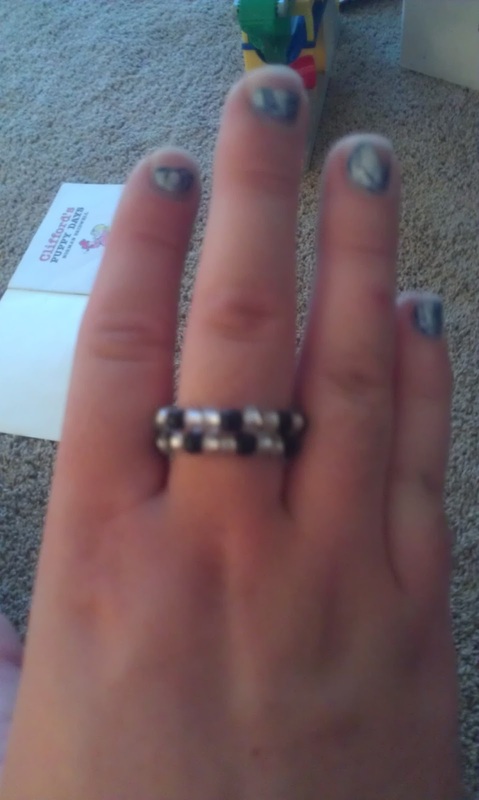 This was a cool ring I made at my mom's in Minnesota. Unfortunately, I left it in the locker at the temple, and they threw it away with the old lockers because they were getting new ones. :( Boo. Again. Oh well. I don't know a whole lot about beading yet, but I have always wanted to do it! And now I am! If you'd like me to share my tidbits of knowledge, I would be glad to! What have you been crafting lately? Love the earrings! Now that tax season is (almost) over, I need to start a couple projects for our master bedroom (1) an upholstered headboard and (2) pillows. The pillows should be super easy, but I don't own a sewing machine so the logistics get a little more complicated. I'm Marla. When I have the time, I love to be crafty and am just starting to sew. My husband just bought me an amazing sewing machine! I love it! Together, we have two very handsome boys, and hope to have a few more one day. Check out my stuff and then try it for yourself!